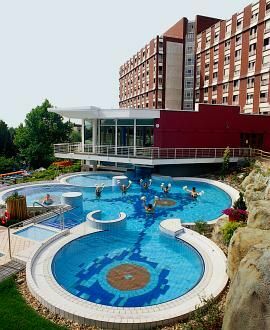 • The first "all-inclusive" spa and wellness hotel in Hévíz, next to the famous thermal lake. • Pampering and relaxation utilising the lake's mineral-rich thermal water and revitalising mud. • Choose from an impressive "all-inclusive" menu selection that focuses on a healthy lifestyle. • Happy children mean relaxed parents! Lovely pool area, paddling pool, playroom, spacious green park, action-packed entertainment programme. 224 air-conditioned rooms, 6 suites, 1 family apartment. French balcony, hairdryer, bathrobe, telephone, minibar, radio, TV. Connecting and anti-allergy rooms, rooms for disabled. Laundry, safe, currency exchange, internet room, WiFi in the lobby, souvenir shop, Danubius Service with indoor and outdoor programmes, newsstand, transfer, rent-a-car and rent-a-bike, car park free of charge for hotel guests, garage (for a charge). The entire resort is non-smoking property. • Garage is available for guests at 7 EUR per car per day. • Pets are allowed for an extra charge of 22 EUR per day. 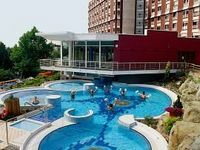 The rate includes: all inclusive board, use of the bathing facilities, use of the fitness room, sport programs in groups, use of a bathrobe, WiFi in the lobby. You can book it at least 45 days prior to arrival. Once a reservation at this rate is confirmed, your credit card will be charged with the 50% of the total amount shown. Regardless whether or not the reservation is used, the amount prepaid is non refundable. Modern, harmoniously furnished room with air-condition, minibar, SAT-TV, business desk/chair, table with two armchairs, dirct dial phone at the bed, bathrobe, bath with bathtub, hairdryer. The room belongs a french balcony. • Reservations can be cancelled free of charge up to 2 days prior to arrival until 16:00.